Stressing out about clouds blocking your view of the upcoming total solar eclipse? A group of lucky astronomy buffs can put their minds at ease. 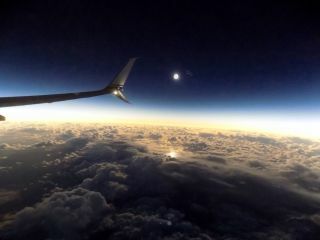 As the moon blocks the face of the sun on Aug. 21, leaving only the corona shimmering in the sky, they'll be watching from 35,000 feet (10,700 meters) in the air aboard a charter Alaska Airlines flight. "We are in a unique position to provide a one-of-a-kind experience for astronomy enthusiasts," Sangita Woerner, Alaska Airlines' vice president of marketing, said in a press release. "Flying high above the Pacific Ocean will not only provide one of the first views, but also one of the best." The airline isn't selling tickets to its high-flying viewing party. Seats are available by invitation only to a select group of astronomers and guests. But Alaska Airlines will give away two seats as part of a marketing promotion beginning July 21 on the company's social media outlets. "We don't yet know how many people will be on board," Alaska Airlines spokeswoman Halley Knigge told Space.com via email. "The aircraft has capacity for 181 guests, but we are limiting the seats available to provide an optimal viewing experience for those on board. It's safe to say there will be fewer than 100 people on the flight, including crew." Alaska Airlines also offered a solar-eclipse flight last year, on which Space.com columnist Joe Rao was a passenger. The video from that flight, shown below, was shot by Mike Kentrianakis with the American Astronomical Society. During the Aug. 21 eclipse, the moon will pass between the sun and Earth, blocking the solar disk and leaving only its wispy outer atmosphere visible. Weather permitting, millions can watch as the moon's 70-mile-wide (113 kilometers) shadow crosses the country through 14 states, starting at 10:15 a.m. PDT (1715 GMT) in Oregon and ending at 2:49 p.m. EDT (1849 GMT) in South Carolina. The path of totality progresses quickly. Not even the lucky airline passengers will be able to keep pace with the eclipse, which will race across the country at speeds ranging from 2,900 mph (4,670 km/h) in west Oregon to 1,500 mph (2,400 km/h) near Charleston, South Carolina, according to an interactive Google map created by French eclipse-watcher Xavier Jubier, with the International Astronomical Union's eclipse outreach group. The variable speed is due to the planet's shape.